While we may argue percents, there is little doubt that if you walk into any classroom today, you will generally see students mentally somewhere else. Is this the fault of students- often attributed to ADD or some other illness? Or, is this the fault of educators and developers who still apply 'baby boomer' educational styles to newer generations? Imagine what will happen when the toddlers today, who are now overwhelmed with learning devices like LeapFrog hit the workforce. What will happen if we continue to teach 'baby boomer' style? Everything is a Learning Tool! In a recent article on Learning Circuits, Clark Aldrich proclaimed Second Life is not a Teaching Tool which then followed with the flame wars in Second Life Redux & The Ultimate MMORPG? What I find disturbing about this entire conversation is how quickly people will dismiss something as not being a learning tool because it doesn't fit conventional models. I would like to propose the counterpoint to this debate- Everything is a Learning Tool! Let's take, for example, the humble stick. How can a stick teach something as complex as Customer Service skills? A stick can serve as a symbol for the perfect interaction path. 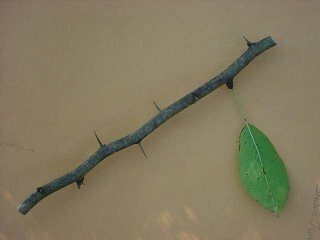 In the example of this stick, if you get off the path, you hit a thorn. A stick can be used as an interaction aid. Pass the stick around to answer questions. A stick can symbolize a reward. Hand the stick to someone who achieves a goal, such as a customer kudo. If all else fails, you can hit your students over the head with the stick if they do something wrong. The fact is, it is not our place to say what is or isn't a learning tool. If we get into this debate, we miss the creativity of finding new uses for, well, anything. If a stick can be a learning tool, imagine what can be made of something like a MMORPG. Instead of debating what is or isn't a learning tool, look at what your students relate to and find a way to use that as a learning tool. Do your students use PSPs? How can you use that? Do your students all like the movie Borat? Use it. Do your students all play Half Life? Use it. We should never force our students into our instructional models. Instead, we should look for how we can relate our education to our students.